ELS Partners, Jamala S. McFadden and Chandra C. Davis, have been featured in the University of Michigan Law School’s E-News Alumni Profile. The article discusses the ideas, collaboration, implementation, and creation by both partners of ELS. Click here to read the article. ELS attorneys and their loved ones shared in an afternoon of brunch and culture. 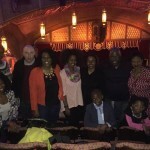 The attorneys took in the day by attending a showing of the Historic Alvin Ailey Dance Theater at their Fox Theater appearance.